You may recall in the not too distant past that I dedicated one of my posts to the solicitation of potential shallow topics from my readers. While I can’t say I had an overwhelming response, I did receive a couple of ideas that seemed reasonable for me to pursue. As a matter of fact, there was one suggestion that stood out from the others as it was truly serendipitous. The idea was that I write about travel for the savvy, shallow person. Now I think it has been long established that I meet the “shallow” criteria and while I am not savvy about everything I am about some things, enough to say I’ve got that characteristic in the bag as well. But perhaps most importantly, I do travel a fair bit and as luck, and perhaps fate would have it, I just happen to be in London, making my way around town as a tourist, so I think I can safely say that I am fully qualified to wax eloquently on the subject at hand. When I first decided that I could write a “how to” for the savvy, shallow traveller, I had in mind something like a “top 10” (you know how I love those lists) of tips. However, now that I am on a jaunt myself it seems that perhaps a better approach is to simply recount some of the experiences that I am having, as these alone should provide a guide of sorts to those who are so inclined to follow in my footsteps. And as expected, it turns out I’m a pretty good shallow traveller. So here, perhaps, is the start of a kind of series that follows me as I make my way through the rather crowded streets of London. After three days of running around like chickens with our heads cut off I can absolutely recommend that the first step to ensuring your travel is as shallow as possible is to slip into your nearest tourist information centre and ask to purchase a “City Pass” for whichever city you happen to be in. There’s a pretty good chance that your city will have one, particularly if there happens to be a river running through the centre, an original “settlement” and at least one national museum or monument. You see, what this pass will allow you to do is visit a multitude of sites over a specified number of days, for one seemingly low fee. There’s a pretty good chance that the booklet you receive with this pass will outline for you the remarkable savings to be accrued by following their suggested itinerary and by doing so you will ensure that you not only visit the most touristy of all sites in the city but you will do so at a pace that prevents you from getting to know even these on an intimate basis. In other words, you’ll likely spend more time in the gift shop which will be strategically placed between you and the exit than you will at the attraction. Which is not such as bad thing as it is there you will pick up a postcard or two so you can remember where you have been. It’s entirely possible that the first stop on your sightseeing marathon might be an art gallery of some sort. In our case, we chose to visit the Tate Modern, a collection housed in a rather imposing building on the banks of the Thames. Now I have been known to appreciate the works of the likes of Warhol, Lichtenstein and Salvador Dali. At the same time I must admit that on occasion, while working my way through the many rooms of a gallery such as this one, I think silently to myself that I too could paint red lines on a white canvas but no one would pay me substantial sums of money to hang it on their wall. I do my best to be tolerant and understanding though until I come across a work of art that I simply cannot understand. 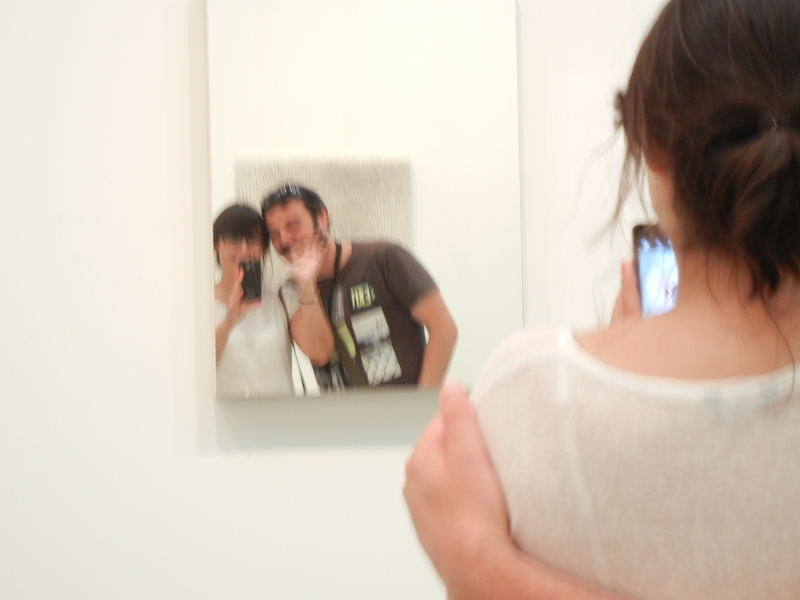 On this day it was a mirror. That’s right, just an ordinary mirror. The idea behind this “work of art” is to allow patrons to reflect on what they see in the mirror without having an image imposed upon them by the artist. Now I might be shallow but I’m thinking that I do this every morning when I get up and go to the bathroom. So I was having a little trouble grappling the exact meaning of the work. Nonetheless, as I stood and watched people walk by I had to admit that the mirror garnered a fair bit of attention and I’m pretty sure there were a few people who, like me, were kicking themselves for not coming up with the idea. But the longer I stood in front of the mirror watching all of the reactions the more I thought about the exhibit and somewhat surprisingly, I came up with an idea of my own. You see, most of the people who stood in front of the mirror decided to take a picture of themselves standing in front of the mirror. 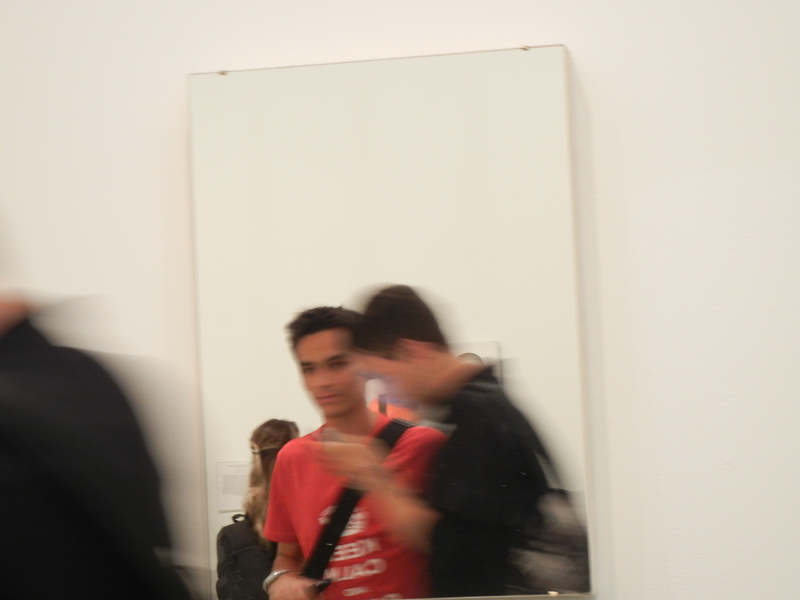 What if, I thought, I could capture the images of the people who had stopped to reflect on the images of themselves? What if I stood behind them and took a picture of them taking pictures of themselves? Would that not make me an artist as well? So that’s what I did and here are some of the results. I’ll be the first to admit I’m no Michael Angelo but come on, it was an art gallery! Not exactly a home away from home for a shallow gal. So here’s a hint. If, while on your travels, you find yourself outside your zone of comfort, try to come up with ways to amuse yourself. You never know what hidden talents you might uncover. I’ll be back as soon as my heels heal with more great tips for the savvy, shallow traveller. Loved your blog on the Savvy Shallow Traveller! However here is another revision of what the SST should do upon arrival in a new major metropolis! Head for the nearest Souvenir Shop….could be as close as your hotel lobby. Purchase one of those Picture Books of London with photos of all the Must See things. Then head off to the nearest Starbuck’s where you purchase your favorite beverage. Don’t forget to purchase the English version of the Starbuck’s card so you can accrue Stars or whatever for your next trip. Then take it easy…..check out all those Must See things from the comfort of you seat. No sore feet, blistered heels or frazzled brains. And it will write the memory…. just as if you had really been there. Have fun in Cambridge! Great suggestion but by avoiding the tts (that’s “tourist traps” for those who are less savvy than I) you may be denying yourself the pleasure of figuring out ways to outsmart the pickpockets. Can’t resist just one more tip. While I am now the proud owner of a “London” card, once registered and linked to your SB account, it reads in the currency of your homeland. If it hadn’t been such an attractive piece of plastic I think I could have just stuck with the gold card. BTW, thanks for the idea for the blog and the read. Did you encounter pickpockets? Re the CARD…did you mean that if you loaded 10 pounds and registered the card it was converted to the Canadian Dollar value of 10 pounds ( as in $16.00CD) or it became $10 CD??? As a shallow traveler many years ago I got scammed out of a 10 pound note in London by a bloke saying that he would send me a picture that he took of me on the street (in the days of film cameras). Alas, no picture, and I never saw the artful dodger again!